Who’s ready to lose weight, get in shape and feel great? Then you are in luck! The great ladies at Fé Fit are giving one lucky winner the chance win a Fé Fit Women’s 13-Week, 90-Day Workout Program that includes 8 DVDs with 28 awesome workouts and several tools and resources to help you stay on track! Plus, save 20% with the promo code listed below! Thank you so much for including my readers here at Tales From A Southern Mom. Summer is coming and we all need to get our bodies back in shape for the bathing suit and bar b que season! I love this program that you can do at home. The Fé Fit Women’s 13-Week, 90-Day Workout Program consists of 8 upbeat DVDs to help women lose wight, tone the body and feel great. Even women who couldn’t shed baby weight before, found that they were able to lose fat and create a feminine tone with the Fé Fit 13-week program! The Fé Fit 90-Day Workout Program is great for women regardless of their age. From early 20’s to women over 50, these workouts are perfect! Strength training adds a nice shape and raises your basal metabolism to burn more calories even while you rest. The flexibility and core exercises improve posture and stability while the isometrics workouts contract specific muscles to tone and target legs, glutes and other areas. Be sure to check out So Simply Stephanie’s Fé Fit Women’s 13-Week, 90-Day Workout DVD Program Review to see what she thought about it! 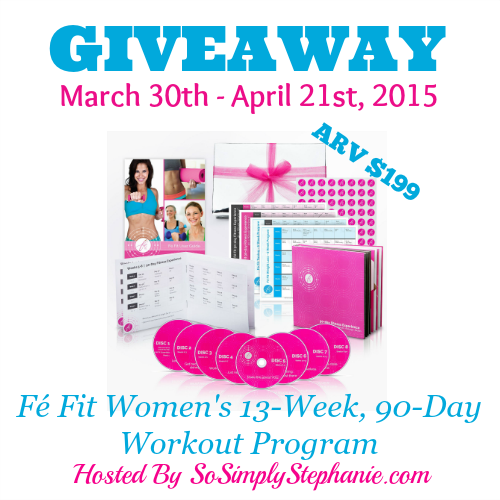 Ready to win a Fé Fit Women’s 13-Week, 90-Day Workout Program so that you can start losing? Here’s your chance! To enter, simply complete the entries on the Giveaway Tool below. The participating blogs did not receive compensation for hosting this giveaway and are not responsible for prize shipment. Fé Fit will be responsible for shipping the prize.Facebook, Pinterest, Twitter and other social media sites are not affiliate with this giveaway in any way. I’d like to get back in shape after having my kids. i would like to win so i can get some weight off. My fitness goals are to remain healthy and strong for my family. I want to be here a long time so that I can take care of them, watch them grow, set a good example, and be there for each of them when needed. I also want to instill in them that a healthy lifestyle is the way to keep physically and mentally fit. I would love to win because I think this program would keep me right on track to maintain these goals plus as an added bonus, it would help me feel and look great for the summer beach weather. Thanks for the chance.